Keywords: Stroke, upper-limb rehabilitation, biomechanics, robotic therapy. Conventional treatment of the hemiparetic upper limb after stroke often involves intensive reaching therapy sessions in which the patient is forced to use their paretic limb. Reaching therapy has been seen to be most effective when the patient’s movements are goal-oriented . Also, the frequency and duration of treatment has a positive impact on overall recovery . This intensive regimen can be very demanding for the therapist, as well as the patient. To ease the burden on therapists, rehabilitation robotics were developed to automate particular exercises, with highly accurate repetition. These devices can provide assistive or resistive forces to the user’s arm depending on their abilities and the goal of the exercise . It is unclear how the mechanics of robot-assisted therapy compares to that of conventional therapy. This information is important in validating robotic rehabilitation technologies and making them more clinically relevant. Biomechanical studies characterizing both the motion and forces in reaching therapy have been scarce in the past. As such, this project aims to understand the mechanics of therapy, to produce a reference for further development of IATSL's upper-limb stroke rehabilitation robot . This research will investigate and enumerate the effects of increasing resistance to the reaching motion. This data will be of use to the rehab community and will also be used to optimise the haptic stroke rehabilitation robot to match what is seen in the clinic. The study involves 3D motion analysis of stroke patients as they undergo a standardized table-top sliding exercise. The subject slides objects of increasing weight in various directions under the supervision of their usual therapist (Figure 1). 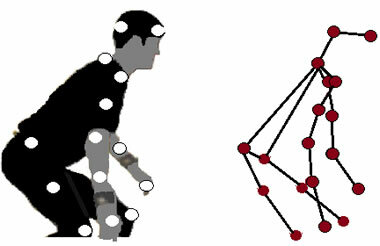 Kinematic data is collected using an optical tracking system, which records the location of various markers placed on the subject (Figure 2). The reaction forces at the hand are measured by a force transducer incorporated into the sliding object. The reaction forces and kinematics provide us with information that can be used to approximate the torques on the shoulders and elbows, using an inverse dynamics model (Figure 3). Figure 1. 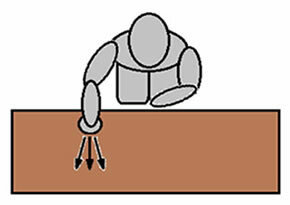 Illustration of the table-top rehabilitation exercise that is being examined. Figure 2. Placement of markers for optical kinematic data tracking system. 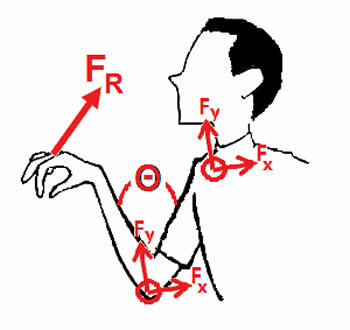 Figure 3: An Inverse dynamics model is used to calculate the forces and torques at the shoulder and elbow of the subject's arm. Langhorne, P.; Coupar, F.; Pollock, A. Motor recovery after stroke: a systematic review. Lancet Neurology 2009, 8, 741-754. Kwakkel, G.; Wagenaar, R.; Koelman, T.; Lankhorst, G.; Koetsier, J. Effects of intensity of rehabilitation after stroke - A research synthesis. Stroke 1997, 28, 1550-1556. Pignolo, L. Robotics in Neuro-Rehabilitation. J. Rehabil. Med. 2009, 41, 955-960.